“The Reality Show” has been an NYU tradition for more than a decade. 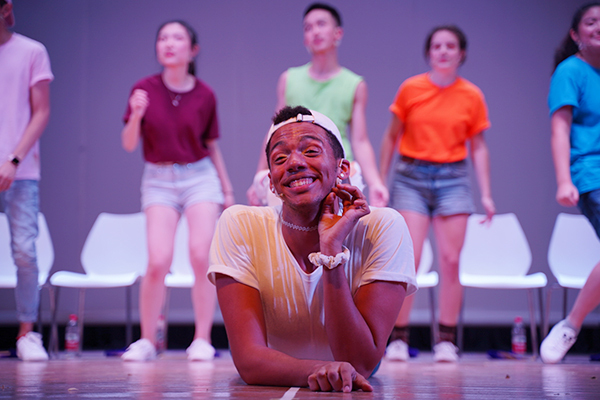 Every summer a group of upperclassman from each of NYU’s three global campuses spend two months in New York writing, composing, choreographing a musical comedy offering each fall’s incoming freshman class some real talk about the challenges of college life. 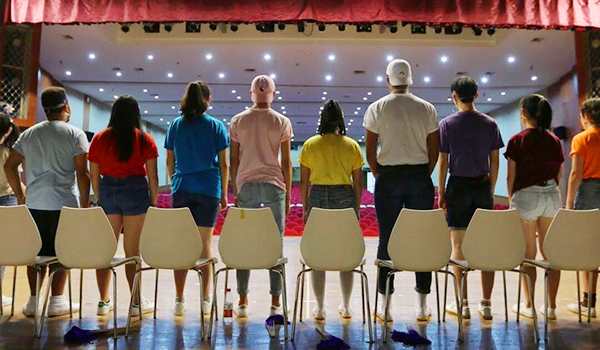 On September 14 at East China Normal University, 11 NYU Shanghai upperclassmen performed a lively and riveting show for the Class of 2022 that tackled topics from homesickness to plagiarism to cultural conflict to alcohol abuse and encouraged students to call the 24-hour health and wellness hotline. Sprinkled among the serious topics were many moments of levity - and extremely practical advice - shuttle bus etiquette and how to avoid traffic elevator traffic jams, for instance. As he does every year, NYU President Andrew Hamilton flew in to welcome and watch the show with the freshman class. See the Reality Show photo gallery here. 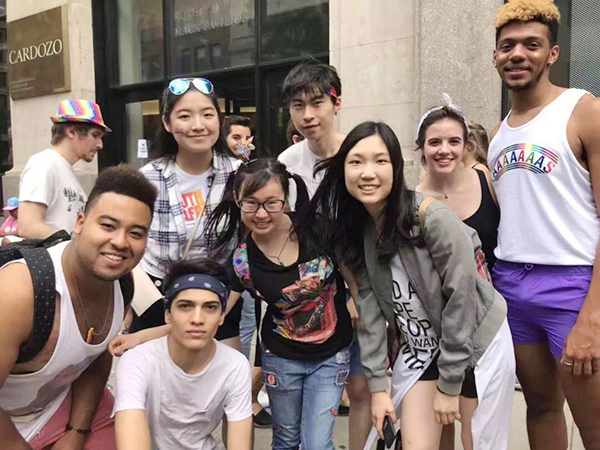 Weilu_flame, a WeChat publication run by students from seven Chinese universities including NYU Shanghai that focuses on idea and experience sharing, talked to the performers this year about their exploration of art and reality, and their memorable summer rehearsal in New York City. Humphrey Whay ‘21: Honestly, I never pictured myself being part of a reality show. I was never involved in any theater, musical, or related training before this. I joined purely out of curiosity and the memory of how much I enjoyed the performance when I was a new freshman. And here I am, grateful about my decision. Alyanna Felix ‘21: I always had a passion for music in high school, but I focused more on instruments at that time. I have played violin for 12 years, but I never really pursued my love for musicals. So the situation for my application was like maybe I will get in, or maybe I won’t. But I just tried out anyway and ended up making it. I definitely do not regret it. Eden Wu ‘21: I joined the reality show just because I wanted to be confident and also I was inspired by my orientation ambassador Fiona, who was part of the previous reality show cast. Cindy Luo ‘21: I was a bit more selfish in my reasons for joining the reality show. I heard during my freshman year that the show was made of pieces of music that the cast composed themselves. That intrigued me because I compose music in my free time but I never had someone to give me feedback on it, so I thought this would be a great time and opportunity. It turned out much better than I expected, because everyone else is so talented and I learned so much from them. Q: What was the summer rehearsal in New York like? What was the most memorable moment during and beyond rehearsals? Zane Fadul ‘21: My favorite part was the fact that I was dancing everyday and I accidentally lost a kilo of weight. I thought that was pretty cool! And another part is when we were doing our writing assignments at night and we literally just spent the entire night writing music together, which was pretty cool. But yet definitely losing weight is my favorite! 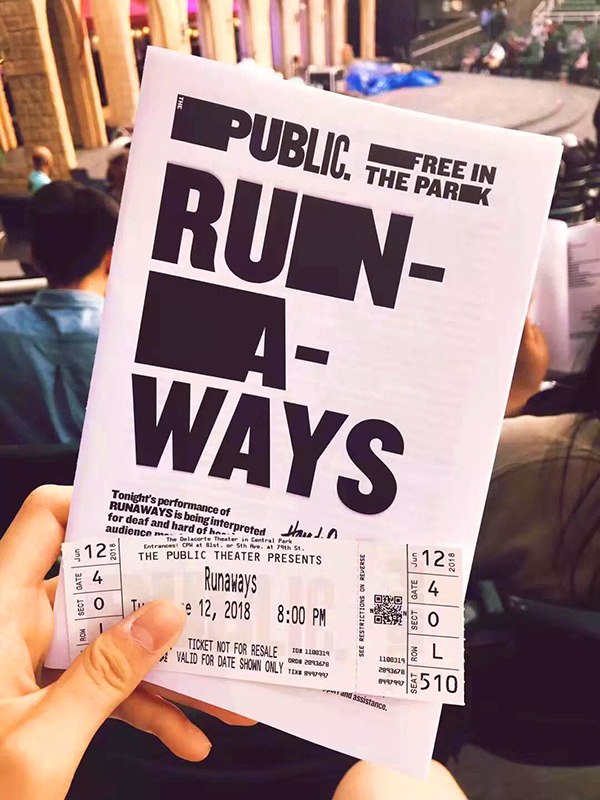 Luna Wu ‘21: My favorite part would be the night when we went to see a show named “Runaways” in Central Park. It was very late when the show ended, and on our way back to the subway station, we all started singing the songs from our show. Later, when I watched the recordings, I found that our footsteps actually matched the songs we were singing. Cecilia Cai ‘21: I just want to mention that at the beginning, we did a lot of ice-breaking activities that helped us get closer to each other. These activities were usually silent, but with a lot of eye contact. It was all about trying to feel each other out. In the beginning, we did not know each other very well. But after those activities, the distance between us became much shorter. Zane Fadul ‘21: When it comes to performing, you have to be serious the entire time, even when you are doing comedy. You are not going to be the one who is laughing, instead, the audience will be laughing. So just always keep a mindset that you are conveying an important message to the freshmen and this is always your number one priority. You need to be careful about when to show seriousness on your face and when to avoid seriousness. Ivan Cornejo ‘21: I feel like it was really easy for us to come up with funny topics, but as we went into deeper territory and looked at the topics that we were not comfortable with, we were all trying to maintain respect. We have the environment where at the end of the day, we all feel safe to talk about something that we are not comfortable with. We know it is always hard to face these serious topics like mental illness, body image and sexual misconduct, but we are never afraid of this kind of difficulty. Q: Regarding the content of your performance, which part is your favorite? Angela Zheng ‘21: One of my favorite parts of the show is Whole Damn Year, because whenever we sing it, I always get a little bit emotional. I remember the last time we sang it in New York and Preston, our director, cried. So, whenever I sing it, I just feel connected to this song and to what it is saying. I hope the students do, too. Luna Wu ‘21: My favorite moment was the beginning and the end of the show. We made a dragon and were running around. That was my favorite moment because I felt we had stripped away all of our burdens, and finally came back to being our original selves, like back when we were in kindergarten playing games. I felt free from worries and pressure; it was a very pure moment for me. Cecilia Cai ‘21: The piece that I like the best is the last song, We Are Not Strangers, because this is the only song that casts from the three campuses share. We would all sing it at the end of the show. 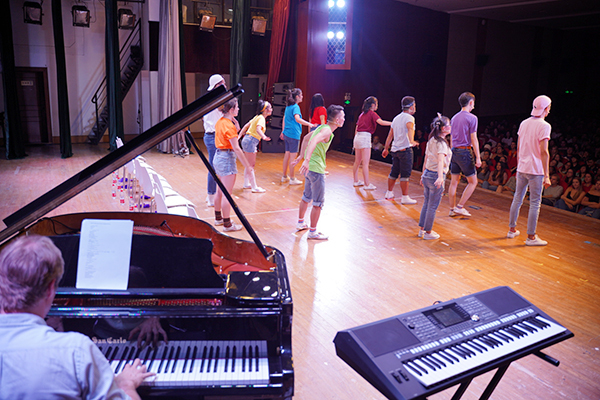 Whenever all of the casts from New York, Shanghai, or Abu Dhabi went out together, we would all sing it, and the feeling was wonderful. Not only is the rhythm of the song appealing, the lyrics are also really good. As the song says, “we are not strangers, no matter where we come from, no matter what cultural background we have, we were not strangers at all after singing this song.” At the end of the rehearsal day, we all stood side by side. One anecdote about the song: Every time we sang this song, we would hold hands with each other. Our director joked that it was disgusting, but we thought it was funny, and made us want to hold hands more. Angela Zheng ‘21: I would say singing and dancing together. It’s about multitasking. Sometimes we forget the lyrics when dancing, or don’t know where to move when singing. Luna Wu ‘21: I feel like another obstacle during the creative process is teamwork. Sometimes different people had different opinions, and even the person who came up with an idea didn’t know the best way to act it out. As a team member, you have to decide when to speak up and challenge it. It was really hard to decide, but eventually, we worked it out.